How do property appraisers determine your home's value? What can you do to build a strong case if you think they're wrong? 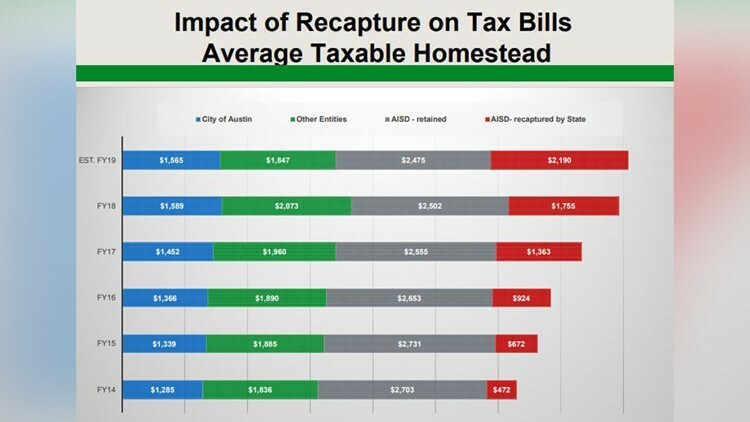 AUSTIN — Too many of you tell us you’re sick of rising property taxes, which starts with the valuation of your home and property. The KVUE Defenders looked in to what you need for a successful property appraisal protest. “My friends joked I didn’t paint the outside of my house for 10 years because I was afraid it would increase my property value,” said Sherry Lesikar who lives in North Austin. She admitted the joke was true. Her focus was to only keep the house structurally sound and avoid a rising property valuation. “I am painting it now because structurally it needs it,” said Lesikar. Lesikar installed a new air conditioning unit and solar panels last year. Then, noticed her property market value increased $10,632. When combining the land value, her total property value increased by $65,632. It pushed her homestead assessed value to the max. “When you look at it, our land value I knew had been increasing every year, but when I looked at it last year it was $150,000 for a one-third-acre lot – .3492. This year, it’s $260,000. That is astronomical,” said Cecelia Gulick who lives near Lake Austin Hills. “Something has to be wrong,” echoed her husband, Paul Gulick. The Gulicks' market land value is the same as their neighbors' across the street for two-thirds less land. “I couldn’t believe the number,” said Cecelia Gulick. Marya D. Crigler, chief appraiser for Travis Central Appraisal District, explained how they get to that number. “To determine what a property would sell for, what you have to look at is what other similar properties in its surrounding area are selling for,” said Crigler. “In order to appraise properties, we are going to look at market data that has occurred in the previous year. So, we are looking at what has occurred in the market, the sales data, and we use that to apply to our mass appraisal models based on what we know to be the characteristics of each property to come up with an appraised value as to what we know what that property would sell for as of Jan. 1." Lesikar, Cecelia Gulick and Paul Gulick all plan to protest their appraisals. “Our goal is to get it right,” said Crigler. 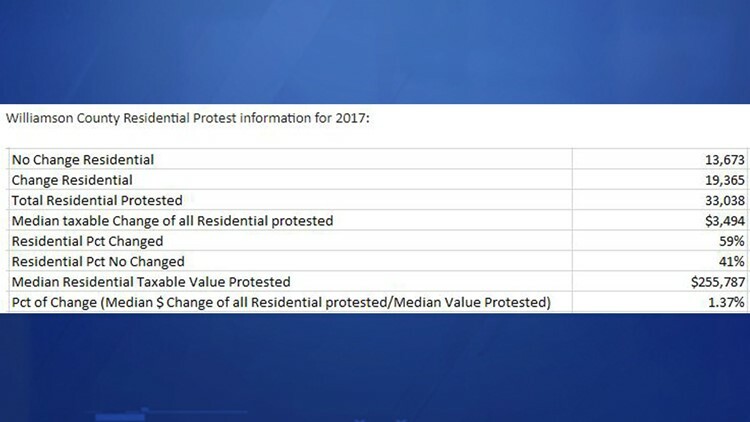 In Travis County, 61 percent of those who protested last year saw a reduction in their value. That means a drop by a median amount of $8,822. A look at the numbers in Travis County. That’s more than those in Williamson County. 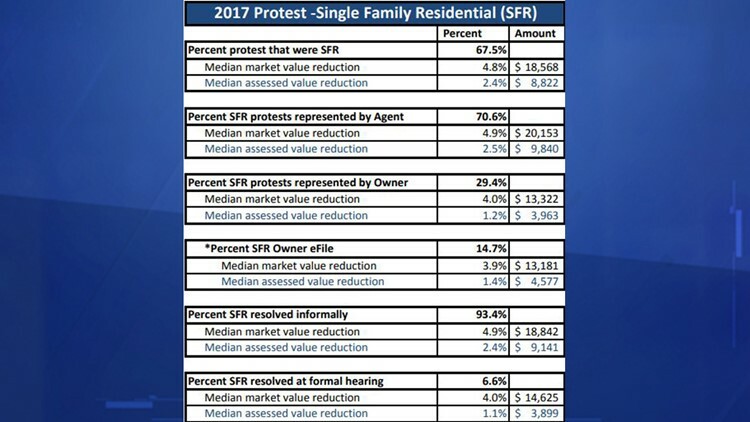 Only 59 percent of homeowners who protested there saw some reduction. And homeowners saw a median drop of $3,494. A look at the numbers in Williamson County. “I have yet to be successful,” said Travis Hennecke of Round Rock. He and his wife Maria hired a professional protest service to help fight their appraised value. “If a professional can’t get it done then I know darn well I’m not going to be able to,” said Hennecke. Their value went up nearly 10 percent each year to the homestead cap. Schools generally have the largest tax rate on home valuations. A look at recapture data. “I do highly encourage someone before they protest to actually do the research. I don’t want them to waste their time going through the process if there are plenty of sales in their area that support the valuation that we have on it,” said Alvin Lankford, chief appraiser for Williamson Central Appraisal District. "This is an important distinction as not everyone needs to protest because of higher values. They need to first decide if the value is close to the sales prices in their area," he added. Williamson County has a special tool to help people before they protest. Anyone can go online and find what homes sold in their area and how that influenced their Williamson County tax appraisal. Click on “Market Data” after searching your property. The actual sale price is hidden. State law allows only real estate professionals access to the price. “There is an effort to make sure every year our appraised values are accurate,” said Lankford. The Texas State Comptroller’s Office audits each appraisal districts’ valuations every other year. "If we raise values more than what we should, what we incur is more and more people protesting," said Lankford. It’s not the value of the home that hurts Sherry Lesikar, Cecelia Gulick, Paul Gulick and Travis Hennecke. “There just has to be a balance and we don’t have that right now,” said Lesikar. In order to build a protest case, real estate professionals as well as the appraisal district suggested taking photographs of damage which would de-value your property as well as a professional estimate to correct the problem. Also, acquire comparable sales from a real estate professional. More information on the process can be found on the Texas Comptroller's Website. The deadline to file your notice of protest is May 15. Disclaimer: While working this story, reporter Erica Proffer noticed her own home value was higher than expected. So, after this report airs, she will start her protest process.